A new law is in the works to save thousands of dollars for Washington, D.C., homeowners and keep renters from holding up home sales. The new legislation follows a News4 I-Team investigation which exposed how some renters have used an old law to make their landlords pay them huge sums of money. "I know there is still work to be done, but I'm excited in what happened today and I think this is a great thing for our community," said Colin Johnson, past president of the DC Association of Realtors. The bill, debated and approved by the D.C. Council's Housing Committee Friday, addresses problems exposed by News4 last year. The committee's report cites several News4 stories saying the Tenant Opportunity to Purchase Act (TOPA) was never intended to be a money-making windfall for tenants, nor a way to hold homes hostage during pending sales. TOPA was enacted decades ago to preserve affordable housing in the District of Columbia. It gives renters the first chance to buy the place they're renting if the owner decides to sell it. "TOPA was designed to give you a place to live at a reasonable rate, a decent place to live, and it never was to take from an owner their rights," said Anita Bonds, chairwoman of the D.C. Council Housing Committee. The new legislation basically exempts single family homes from that entire process with a narrow exception for elderly and disabled tenants who had a lease signed by December 31, 2017. The proposed legislation was amended to define "elderly" tenants as anyone 62 years of age or older. D.C.'s real estate community turned out in force Friday, wearing yellow "Fix TOPA" stickers to support the committee's decision. This version of the law goes much further than the original fix proposed last fall. "We are doing what's right. We're taking care of the people of DC and that includes everyone, whether you're rich or poor, it's our responsibility," said Bonds. The News4 I-Team investigation revealed horror stories from owners who were trying to sell and potential buyers who had their sales delayed for months because of TOPA. Some told News4 they had to pay their renters tens of thousands of dollars for their TOPA rights, which felt like extortion. One local attorney told the I-Team "TOPA chasing" had become a $100 million-a-year industry in the District and that had become the focus of his entire practice. "I think everything that happened not only with (News4's) story but also what was happening in our community just made it that much more apparent that action needed to happen as soon as possible," said Johnson. 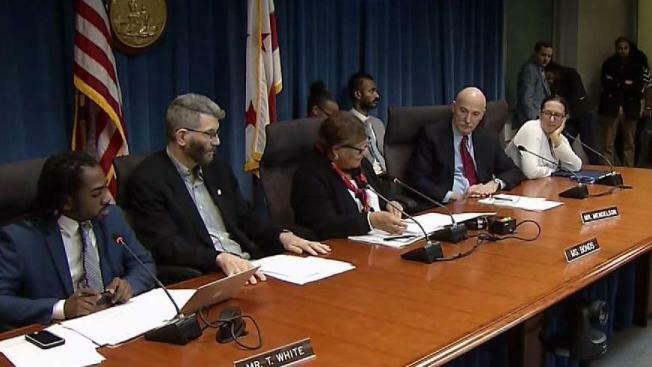 In a hearing following the I-Team reports last fall, several realtors and single-family homeowners told the DC Council about the burden TOPA placed on them, and how that was actually discouraging owners from renting out all or part of their properties. Members of the real estate community attend the Feb. 23, 2018, meeting of the D.C. Council Housing Committee wearing their yellow "Fix TOPA" stickers. Lower rental inventory drives up rent prices, so if more owners are willing to rent, that could lower rents across the District. Owners forced to pay tenants to leave, have also passed those costs on to the eventual buyers, artificially inflating sales prices. The new legislation would have no impact on renters living in multifamily apartment buildings- they would still get the traditional TOPA rights, designed to help protect affordable housing in gentrifying neighborhoods. The bill is scheduled for a full council vote on March 6.